This historic Lighthouse has served as a beacon to ships for more than 130 years. Constructed of brick and stone the tower has weathered many northeasters and Atlantic Hurricanes. The United States Congress appropriated funds to erect the light in 1859. Construction was halted during the Civil War but resumed in 1866, and continued until completion on October 1, 1867. The foundation is a bed of stone placed on top of one of the Islands many sand dunes, 22 feet above sea level. Thousands of bricks make up the main tower, each hauled to Assateague Island from the main land by barge and horse drawn wagons. 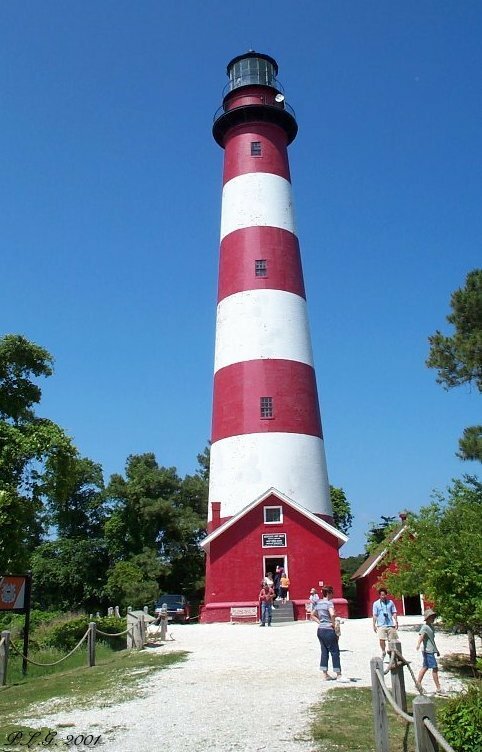 Standing 142 feet tall on the hill places the light 162 feet above sea level and making the modern directional coded beacon lights visible 22 miles at sea. The DCB lights were installed in 1963 when electric line were ran to the island. This light consists of to large drums, each with a 1000 watt bulb. This light pattern consist of a double flash every five seconds. In 1969 the lighthouse was painted with white and red bands, giving the lighthouse a unique signature to passing ships.